NO AFTER CLASS/CAMP SUPERVISION. Absolutely no supervision is provided after enrichment classes/camps are dismissed unless your child is enrolled in an Extended Day Program. All children must be picked up promptly when class is dismissed or you will be charged a late pick-up fee of $5 per 5 minutes starting after the first 5 minutes that class/camp has been dismissed, to be billed and paid prior to the child attending the next class. Late pick-up fees are not collected by the on-site staff. Parents understand that to comply with the sign in/out procedures, the parent will come into the Program to drop off (for camp locations) and pick up their child(ren). Engineering For Kids shall not release a child to any person without parent's consent. Engineering For Kids reserves the right to require identification of any person picking up your child. In the event that person is designated NOT eligible to pick up a child, the parent agrees to provide Engineering For Kids custodial paperwork. Engineering For Kids will contact persons listed as Other Contacts if the child has not been picked up within 15 minutes after class/camp has ended for the day. I, on my own behalf and on behalf of said Minor, hereby certify that I authorize the previously named individuals listed in the “Other Contacts" section of this form, permission to pick-up and assume responsibility for the minor listed on this form. More than two late pick-ups could result in suspension or termination of your child’s enrollment in the program. Should your child be absent, please inform us by contacting us at by email or phone, as soon as possible. In the case that you cannot reach us directly when notifying us via phone, please leave a detailed message with your child’s first/last name and the location/time of your child’s class. If we do not receive any notice of the child’s absence, once the program day begins, we will first ask the school (if applicable) of any known absences or early dismissal, followed by an attempt TWICE to reach parents/guardians via the contact number listed on the information form. Refunds are not available for vacations, special events, short-term illnesses, or other personal commitments that prevent attendance (i.e no prorating). EXTENDED ILLNESS. A credit, transfer, or refund may be available for an extended illness. A doctor’s note and written note from the parent or guardian explaining the situation must be received within eight working days from the first day of absence. Parents are responsible for reminding both student(s) and their teachers (school programs) to arrive to class on time. I agree to inform Engineering For Kids within 24 hours if my child or any member of the household develops a reportable communicable disease (immediate notification required if the disease is life threatening). The Engineering For Kids staff shall notify parent/guardians whenever their child becomes ill and the parent/guardian will arrange to have the child picked up as soon as possible. In the event I cannot be reached in an emergency, I hereby give permission to the Engineering For Kids staff to seek medical treatment at the nearest medical facility. I understand that I am responsible for the medical expenses incurred by my child and that Engineering For Kids advises that I carry health insurance for my child. I do hereby agree and consent to my child’s participation in Engineering For Kids enrichment program during this school year and do assume all risks and hazards which are conducted as part of the associated activities. I hereby release, absolve, indemnify, and hold blameless Enrichment Opportunities, LLC and MDG Gulf Coast, LLC dba Engineering For Kids, its officers, directors, employees, contracted employees, independent contractors, instructors, agents, organizers, and volunteers (hereinafter referred to as “the program”) of any and all liability for damage, injury, or expense of any kind arising out of or connected with my child’s participation in the program. I understand that in case of a medical emergency, my own personal medical plan will be used. As a condition of participation in the program by the student named in this form, I acknowledge that I have read this consent form, and knowingly, on behalf of my child, assume all of the risks associated with participating in any way in the program. As consideration for being permitted to participate in the program, I hereby agree that I, my assignees, heirs, distributees, guardians, and legal representatives will not make claim against, sue or attach the property of the school district or the program, or their Affiliates or the supplier of any of the equipment used in these activities for injury or damage resulting from negligence, failure of care, omission or other acts, howsoever caused by an employee, agent or contractor of the school district or the program and any affiliate as result of incidental to my child participation in these activities. I hereby release, to the fullest extent permitted by law, the school district, the program and the affiliates, from any and all actions, claims, demands, or liabilities that I, my assignees, heirs, distributes, guardians, and legal representatives now have or may hereafter have for injury or damage resulting from my son/daughter’s participation in these activities irrespective of whether the same is based on breach of warranty, negligence, strict liability or any other theory or recovery. Our program is designed to offer quality enrichment classes to students after school and during school breaks. Disruptive behavior affects the quality of the teaching. Students are expected to follow all rules established by his or her instructor, and any failure to comply will result in dismissal from the program at the discretion of the instructor. Engineering For Kids reserves the right to release any student whose behavior becomes unmanageable, without refund of program fees. This action will be taken following TWO verbal warnings and ONE written warning. Intentional harm of any other persons or person’s property while a program (after-school class, field trip, camp) is in session will NOT be tolerated; this will result in the student’s IMMEDIATE termination from the program without refund of program fees. I hereby authorize my child’s photo/video to appear in class newsletters, the media or to be used to promote or publicize Engineering For Kids programs and I waive any rights of compensation or ownership thereto. Students’ full names will not be disclosed or mentioned. Registration and supply fees are non-refundable. Two weeks prior to the start of a program, a refund of the tuition is available if the parent provides a written request. Cancellations requested between 2 weeks and the first day of a program will be subject to a $30 cancellation fee and the balance will be refunded or credited. After the first day of a program, there will be NO refunds or credits. However, if registered with the monthly payment option, written notice by the 15th of the month is required in order to not be charged or billed tuition for the next month. A cancellation fee of $30 will apply. Once purchased, there are no refunds; however you may change the week and/or location of the camp, subject to availability, for a $35 change fee. Written notice 7 days before the first day of camp is required for any changes. Please make every effort to arrive and depart on time to maximize all campers learning. 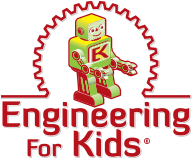 Engineering For Kids maintains that all teachers and students are treated with respect at all times. Engineering For Kids reserves the right to cancel any class with less than 8 students registered. Full refunds will be provided in that case. All students must be 100% potty trained. Students should arrive no earlier than five minutes before class begins to permit our staff to prepare. Parents are expected to pick up their child promptly at the scheduled time (see Pick Up Policy). DUE DATE: Payment is due at the time of registration to secure a seat, pending space availability. OUTSTANDING BALANCES: Registration cannot be accepted from anyone who has an outstanding balance from any previous Enrichment session, or other unpaid balance with Engineering For Kids. NON-SUFFICIENT FUNDS: If your check is returned to us unpaid due to non-sufficient funds (NSF), your child may by unable to attend classes until the funds are paid (including reimbursement of any costs we incur for the NSF check payment). We reserve the right to refuse any future payments by check in the event of your payment from a NSF account. EXTENDED PAYMENT PLAN (Monthly - After School Program Only): An extended payment plan is available to you as a convenience for an additional surcharge of $9 in the Fall semester, and $12 in the Spring semester. First payment (1st tuition payment plus registration fee (includes supply fee)) is due at registration; Remainder of payments are due by the 6th of the month and must be paid online. Please make your payments in a timely manner to avoid late fee charges. A late fee of $20 will be assessed per payment, for each payment not made within 2 days of due date. We are solely dependent on payment of tuition and fees to meet our expenses and continue offering such programs. Failure to meet your financial obligations will result in suspension of your child(ren) from Enrichment class(es) if payment is not received by the 8th of the month. CHECKS: Checks are only accepted online through PayPal or Dwolla (for more information about security, vist:https://www.dwolla.com/security). Do NOT leave your payment with the school, or with your Enrichment teacher.